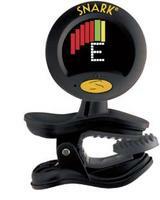 Clamp-on digital tuners have been among us for some time, and most of them work reasonably well. The Snark SN-8 tuner, however, absolutely nails the technology. It’s so quick as to be clairvoyant, flawlessly accurate, impossible to deceive even if it finds itself tuning next to a 787 taking off and easy to read. It also looks cool. While Snark makes a number of tuners which are ostensibly intended for use with specific instruments – a guitar tuner, a bass tuner, a violin tuner and so on – the SN-8 appears to care little for these distinctions, and happily tunes anything it’s affixed to. It took a bit of head scratching to find a way to clamp one to a fiddle – horizontally across the bottom of the peghead works nicely. It also works clamped to the bell of a sax – I’m pretty sure that’s what killed the last clamp-on tuner I owned. Unlike traditional electronic tuners, the Snark listens to whatever it’s intended to tune through a small contact microphone embedded in the soft rubber jaws with which it grasps its subject instrument. As such, it gets to ignore most of the ambient noise around it, which would confuse a non-contact tuner. The result of all this stealth is that the Snark can determine the pitch of a note really, really quickly. It displays the nearest letter for each note it discovers, and a bar graph to indicate how flat or sharp it is. Twist the appropriate tuning peg until the bar graph’s highlighted segment is in the center of the Snark’s display and all will be right with the world. While there are a great many less expensive digital tuners that can perform the foregoing task, the Snark rocks because it can come to a conclusion in almost no time at all… and it’s never wrong. Lesser tuners seem to dither for an eternity before they lock onto the note they’re tuning, oftentimes with a considerable degree of uncertainty if they’re confronted with extraneous sounds. The Snark is damned near spooky. Despite its apprehension as something of a one-trick pony, the Snark SN-8 has a number of worthwhile hidden features. If you play guitar with a capo to transpose chords, for example, you can make it lie to you by up to four flats. In this mode, if you put a capo on the first fret of a guitar, the open E string will play F. Set the Snark to one flat and it will display an E when the first string is correctly tuned. While the Snark defaults to tuning based on A above middle C being 440 Hertz, you can calibrate it to any numerical reference you like between 415 and 460 Hertz, should you need to get along with weird or somewhat antiquated instruments. Finally, the Snark can be a metronome… albeit only a visual one. Touch the switch on the side of the device twice to set the interval between beats and a red heart will flash on its display. I confess that I’ve rarely had occasion to try any of its more esoteric capabilities. Its one trick is all I could ask of an instrument tuner. With a street price somewhere south of twenty-five dollars, the Snark SN-8 easily qualifies as one of the best guitar accessories in the known universe. Tuning instruments is a fundamentally boring and uninspired exigency that most musicians would clearly assign to a roadie if one were handy. Consider the Snark as a roadie that will fit in your case, never be found in the parking lot blasted on cheap rye and afforded of perfect pitch at a moment’s notice. Afterword: Seriously impressed with our first Snark, we bought several more Snarks… ‘coz nobody really wants to stand in line to tune. Sadly, one of our Snarks later developed hearing difficulties. In fairness, technology breaks now and then. The deceased Snark was still under warranty – just barely – and we contacted Snark Tuners about it. They sent us a new Snark without even asking for a receipt. It was unquestionably the least involved warranty issue we’ve ever encountered… and the friendliest. Our replacement Snark also came with the best apology we’ve ever seen for dead tech. It read “Sorry! Ah man. We feel like navel lint. Here’s your free Snark replacement for your D.O.A. unit. No need to send the dead one back. Let it rest in peace. Thanks for your support of Snark. Lo siento mucho!” That last sentence means “I am very sorry” in Spanish. We were huge fans of Snark tuners before this, but now we’re pretty sure our fandom can be seen from space.